Y’all may recall how much I sing the praises of breakfast dishes. But when you’re someone who hits the snooze button several times a morning–every morning, spending a lot of time in the kitchen in the AM is the last thing I ever want to do. So what’s a breakfast lovin’ gal to do? Create recipes that you can make the night before! Yup. Dishes that can be prepped hours before cooking that are no fuss- no muss but don’t sacrifice on the flavor. 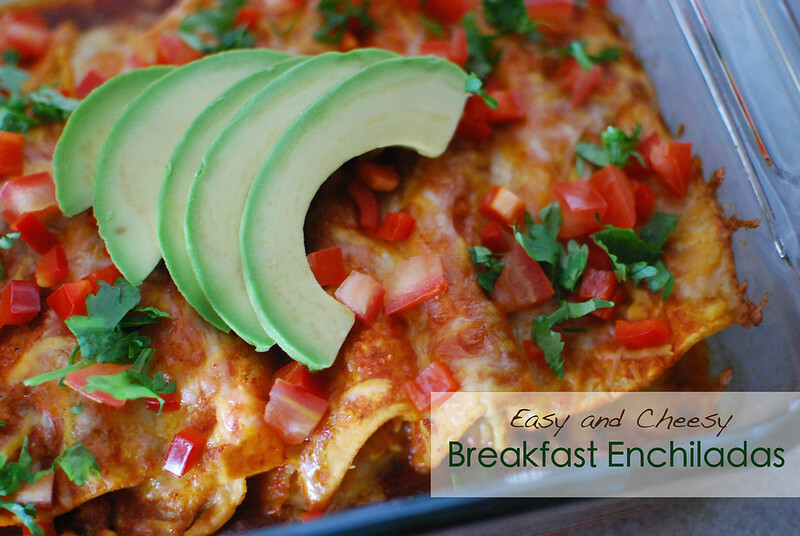 These super easy, super cheesy Breakfast Enchiladas fit the bill. They’re filled with tons of spices, eggs, sausage & cheeses and then rolled up in corn tortillas before being smothered with more enchilada sauce and shredded cheese. At this point, you can either bake the enchiladas or throw them in the fridge overnight. I often choose the latter option so that when my first alarm goes off in the morning, I can roll out of bed to preheat the oven….and then roll back in until it reaches temp. After a quick snooze, I throw the dish of enchiladas in and bake for about 20 minutes. Which just so happens to be enough time for another quick snooze session. Yea–I’ve got issues. But by the time the timer goes off, the enchiladas are ooey-gooey perfect! 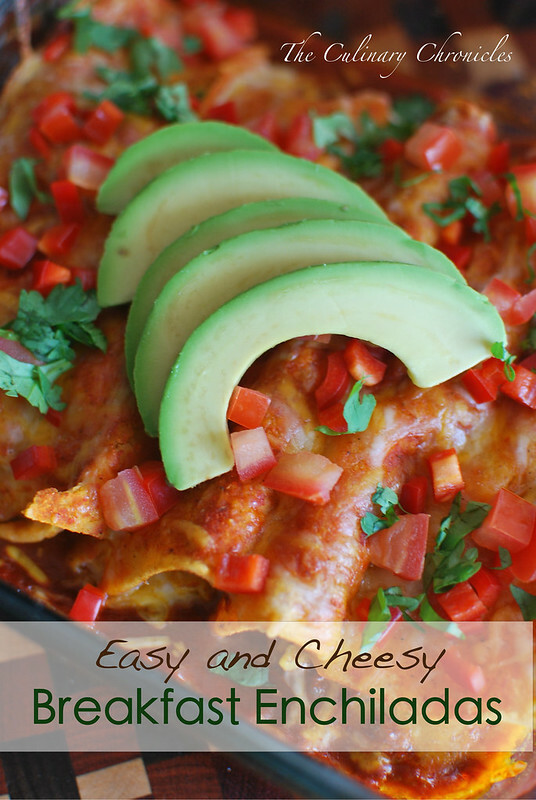 I dress them with some diced tomatoes, fresh cilantro, avocado, salsa and sour cream–Delicioso! Now if I could only teach my puggle how to make coffee…. In a bowl, whisk together the eggs, milk, taco seasonings, red pepper flakes and 2 tablespoons cilantro. In a skillet, heat the vegetable oil to medium and add the breakfast sausage. Use a wooden spoon to crumble the sausage and break into small pieces. Cook the sausage until browned and transfer to a plate. Add the onions, jalapeno and garlic to the skillet and cook for 1 minute. Pour in the eggs. Continue cooking, gently stirring the eggs with a rubber spatula until the eggs have almost set. Fold in the cooked sausage and cook for an additional minute. Season with additional salt and pepper and remove the skillet from the stove to allow the mixture to slightly cool. Coat the bottom of a 13 x 9-inch casserole dish with a few spoonfuls of the enchilada sauce. Pour the remaining sauce into a shallow dish. Wrap the tortillas in a kitchen towel and microwave for 30 seconds so that they become more pliable. Dip each tortilla into the dish of enchilada sauce to coat both sides. Place a few spoonfuls of the egg/sausage mixture in the center of each tortilla. Top with shredded cheese and roll the tortilla, securing all the fillings inside. Place the filled tortilla, seam side down into the casserole dish. Repeat with the remaining ingredients, placing each enchilada snuggly against each other. 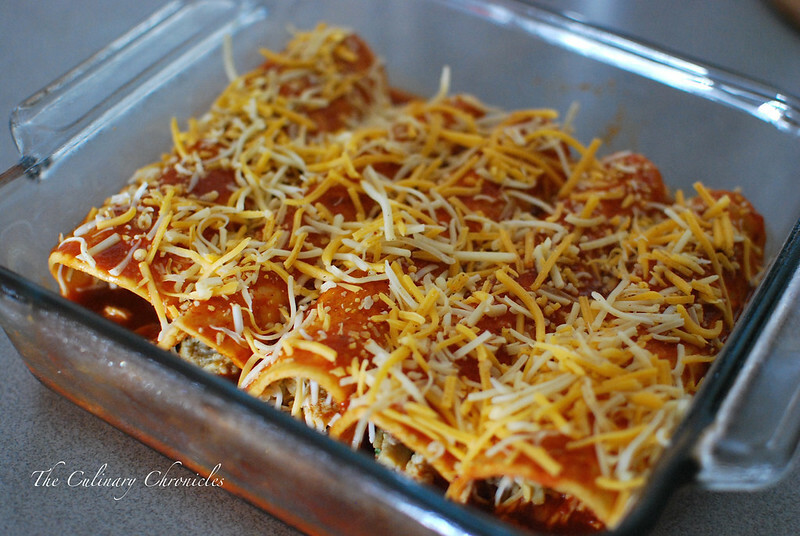 Pour the leftover sauce over the enchiladas and top with the remaining cheese. Bake for 15-20 minutes or until the cheese has fully melted. Remove from the oven and top the enchiladas with scallions, tomatoes, bell pepper, avocado and the remaining cilantro. Serve warm with salsa and sour cream. I’d give a kidney for these. Bookmarked! Thank you!!! You bet l will make these tomarrow!